Yale, Beinecke Library, Takamiya ms 24 (the ‘Devonshire Chaucer’). Yale, Beinecke Library, Takamiya ms 32 (the ‘Delamare Chaucer’). If you’re reading this, I trust you’re already familiar with manuscript variance with the Cook’s Tale or the variously omitted stanzas from the Envoy to the Clerk’s Tale (or the omission of the Envoy altogether). I trust you’ll want less famous examples, maybe to help you through this term, or to get you started on the next. This is the Knight’s Tale. How do the pieces fit together? Where the Riverside has “Explicit secunda pars / Sequitur pars tertia,” and where Hengwrt 25v has “Explicit prima pars / Incipit pars secunda,” Christ Church 152, 26v, has “the ordinannce of lystys that thesyiis ordaynyd.” Does the Knight’s Tale comprise abstract parts of equal weight, or is it a sequence of events? If so, whose doings are worthy of “ordaining” the divisions of the plot? Or here’s the Reeve’s Prologue in Corpus Christi College ms 198, 54v. Our medieval scribe has started the tale at the prologue itself (“Explicit fabula molendmain [the Miller] / here bygynneþ þe Reeues tale” — note the mixture of Latin (Explicit) and English (bygynneþ)); an early modern reader intervenes, and writes “Prologue” in the margins. Are they comparing manuscripts? Or is it a sign of an independent interpretation? Harley 7334 89r, with a red “Narrat” in the margin. Is it just “words between” the Friar and Summoner? It is an “interpretation” of the Wife’s tale? An “interruption”? Or is it just a neutral ending of the Wife’s prologue, and the words of the Friar, following neatly? It depends! And a lot depends on it. Should the carter be taken down to hell? “Nay q[uo]d þe deuel,” he absolutely should not. The Fox children crowd in over the course of the sixteenth century, here and on the next page, before the Franklin’s Tale — not the Merchant’s — begins. Cambridge Trinity R.3.3 38r gives us an early modern reader who, like many of us, is curious about the rest of the Squire’s Tale. They’ve clearly “sought in diuers places” for the “the reaste” but found nothing except the final two lines about Apollo, just like you have in your Riverside. I warned them, but they’re still shocked. I’m befuddled but I’m also delighted, because the tale really is that horrible. What’s the relationship between ignorance and holiness? In other versions of the tale, the boy’s 10 years old; here he’s 7, just before the age of responsibility, killed before he learns how to read. The nun herself wants to become like a child of 12 months old, unable to speak even. The Prioress herself snarks at the monk, and even the ‘holy abbot’ in the tale is, in a way, the one to kill the boy. And what does this suggest about the way that ‘simplicity’ and ‘goodness’ tend to be equated? Is there something sinister about this? Similarly, why do you assume that the Prioress’s intense feeling for the Virgin has to be faked? Why do you assume that simplicity and simple expression are more authentic than fancy talk? The tale blames Satan for inspiring the Jews to murder; or it thinks Satan makes his nest in Jews’ hearts. Are the Jews responsible or not? Unlike other versions of the tale, the Jews don’t murder the child out of a sense of religious duty. The Prioress’s Tale isn’t a Ritual Murder case, but rather a random, unthinking act of violence. Also: the tale has a pure little boy who — as a sign of his pureness — sings a song he barely understands and who tends towards intellectual neoteny. The Jews do what they do because they have to; the boy does what he does without understanding. They’re both machines, objects not agents, the one evil, the other good. Why does Chaucer strip agency from both Jews and boy? 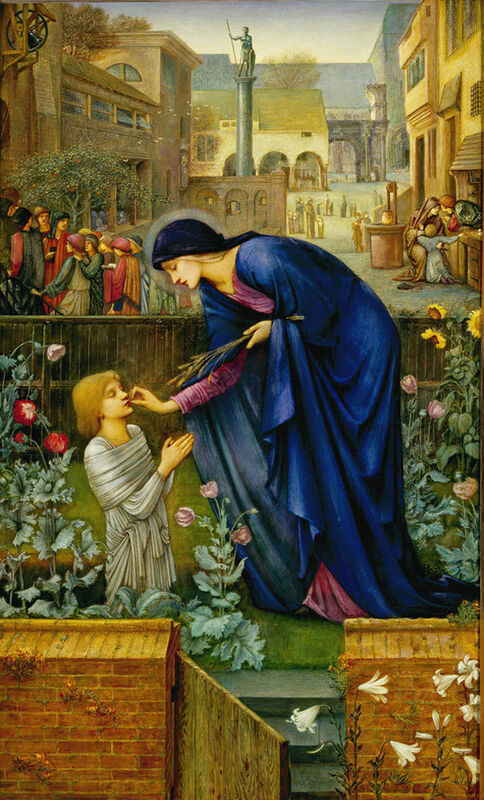 This painting, by or based on Edward Burne-Jones, appears regularly in my students’ presentations on the Prioress’s Tale. Probably yours too. No wonder: it illustrates the Wikipedia page on the Tale, and dominates the Google image search results. Though I’ve recommended ArtStor for images, the students go with what’s most readily at hand (probably yours too). I imagine, though, that even if they’d gone to ArtStor, they’d find much the same stuff (but as the Brooklyn College library website is shockingly down….). I’m going to tell them this: the image, featuring a standard pre-Raphaelite pose for Virgin and clergeon, is itself antisemitic, and just a little more subtle than the images, just as popular in presentations, of hooked-nose Jews (there, usually, to show the continuing force of antisemitic stereotypes). I thank the St Louis Museum of Art (warning AUTOPLAY) for making some of this clear to me: the image invites us in, opening the gate to let us join the virgin and boy. The Jews and the murder are in the background, cut off absolutely from the virgin by the garden wall, barred from this innocent paradise. Now, the St Louis Museum seems perfectly fine with this, and perhaps my students too, though far more innocently. As I’ll argue next week, the painting is as antisemitic as the tale itself to the degree that it reproduces without condemning both the tale’s hatred of Jews and its saccharine logic of sanctity. I’ll say the painting, in fact, aims to become like the Litel Clergeon. It pretends not to understand the tale. It just presents the encounter between boy and (virgin) mother — the virgin mother who can belong to the boy entirely precisely because she remains a virgin1 — as the tale’s actual content, while forgetting, as much as it can, how the tale proves the boy’s innocence by hating Jews and by murdering the boy. The painting pretends to be a holy fool and is all the worse for it. all the ways in which various anti-semitic discourses and even meta-anti-semitic discourses [whether in the form of apocryphal stories, reductively stereotypical tropes, satire, etc.] are made to kind of “disappear” in or move into the background of our “readings” of various texts. A nasty nutshell. It’s a prefeminist, prepolitical way to teach the poem, preserved in amber, and no doubt preserved even in some of our younger teachers.